One of the things we loved about our new house when we first came to look at it was the kitchen, which is a thing a beauty in most aspects (would have loved a double oven and a six-burner stove, though!) but also benefits from having a huge pantry. It’s actually ridiculously huge. It’s floor to almost ceiling and deep. It’s as deep as our refrigerator. It holds a lot of stuff, but it’s hard to get to a lot of that stuff. Inevitably something you want is behind a bunch of other stuff, or under the bag of chips you stuffed in there so the kid wouldn’t find it. Or something gets put on that big up high shelf I can’t reach (and can barely even see) from the ground, never to be seen again. What I’m getting at is: It’s so easy to lose stuff in. And hard to keep organized, at least so far. 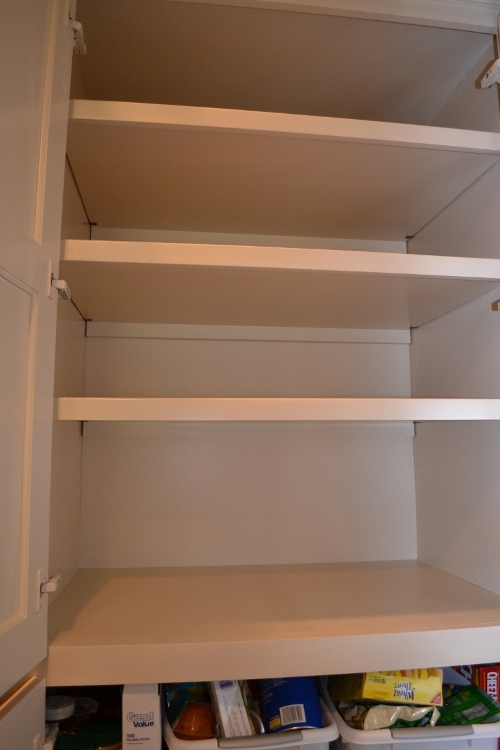 Big, beautiful, and a hot mess: my before pantry. So when Project Simplify headed into the kitchen, I knew I’d be spending the week in my pantry. I haven’t gotten as much done as I’d like, which I blame on my husband being away and the fact that it’s Spring Break next week so I’m trying to get as much done before that as I can. 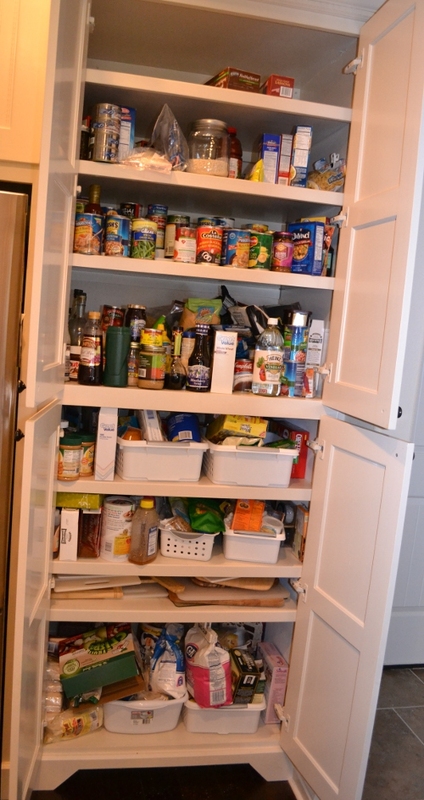 But I did get the top half of the pantry done, and I wanted to share some thoughts for people who might be struggling with a messy pantry, large or small. Before you even open the pantry doors, make sure you have a lot of space to pull out and organize the things you’re taking out of the pantry. 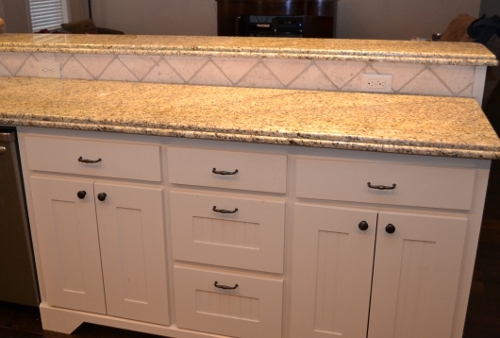 If your kitchen is small, you might need to take over the dining room table, the floor of a nearby room, whatever. It just makes it so much easier if you can organize things out in the open and then you’ll know how and where to put things back. My counter is never clear. But it makes me happy when it is. 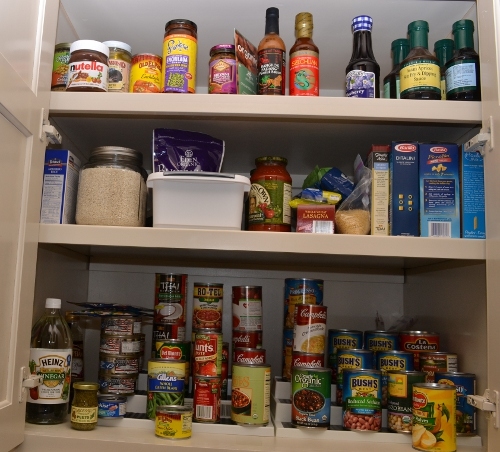 Take everything out — for me that was just the top half, but if you have a reasonably sized pantry you can do it all at once. Immediately toss anything expired. Recycle or compost what you can, but I’ll admit that I just throw away expired canned goods rather than opening them up to unleash whatever horror might be inside just so I can recycle the can. If there’s no expiration date on whatever you’re looking at, toss anything you don’t clearly remember buying (or that you do remember buying, and it was a long time ago), or anything that just looks off: rusted, bulging or dented cans, anything moldy, stale or otherwise funky. If you have the space, sort everything as you take it out into general categories. I didn’t take a picture of this, but I had sections for pasta, grains, sauces, canned tuna, canned tomato product (yes, that’s important enough in this house to get its own section), soup, canned fruits and veg, vinegars, etc. Taking the time to do this now will both show you what you need to eat soon because you have a ton of it (for me: brown rice, beans and egg noodles, not all together, I imagine) and help you decide where things should go when you put them back based on how much space you’ll need. Give the shelves a quick wipe down and a take a break. Acknowledge the good work you’ve already done. The cupboards are bare. Beautiful. What wasn’t working in your pantry before? My problem was the depth, that things would get stuck behind other things and I’d forget they were there. And of course the high shelves. That I can’t change, but I know to not put things I need to access on that high shelf and to try not to put things in the back that are too small to see. Think about what you use often and need easy access to, what you want to have at eye level, what’s safe if you have kids in the home and so on. I decided I wanted to move my canned goods down because I was buying things and not using them. Also, I figured it was safer to have lighter things (like pasta and rice) on the higher shelf. I'm not using much of the depth of the pantry here, but it sure looks good. Try to put like things with like when you put things back. Since moving the canned goods, they’re now all together (the tomatoes used to be separate from the others), all the rice and pasta are together (though the egg noodles ended up behind the canned goods, and I still need to put the brown rice in a canister and put it somewhere). Sauces, which we don’t use often, are on the next shelf, which is pretty hard for me to reach from the ground. Having like with like helps, too, when you have to put things behind other things. There are boxes of pasta in two “layers,” but I know the stuff in the back is unopened and has a later expiration date than the stuff in the front, so I don’t need easy access to it. The top shelf is empty right now, but I’m thinking some non-food stuff I don’t need to access very often should go up there. Like maybe serving trays because that shelf area isn’t very tall. I still hope to get to the bottom this week, but for now I’m just enjoying how nice the top looks! 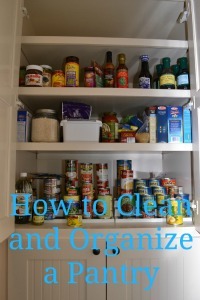 Do you have any pantry cleaning or organizing tips? For instance, the bottom holds all my baking stuff; do you have a good storage system for dry goods? I’d love to hear it! This post is linked to the Somewhat Simple Strut Your Stuff link party, Transformation Thursday at The Shabby Creek Cottage and Creative Juice at Momivore’s Dilemma. Check them out for tons more crafty ideas.